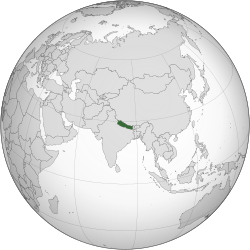 Nepal, officially the Federal Democratic Republic of Nepal, is a landlocked country in South Asia. Kalapatthar, Everest in Nepal The tallest mountain of World having 8848m height lies in Nepal. Main gallery: National symbols of Nepal. Jomsom, capital of Mustang district. Behind Begnash dam of Begnash Tal (lake) Pokhara, Nepal. Beautiful scene of sunset from a rice plantation field Terai region's Hattikilla, Jhapa, Nepal. A View at Chisapani, Sindhupalchowk, Nepal. Main gallery: Temples in Nepal. Boudhanath temple after earthquake in 2015 of 7.8 magnitude in the process of rebuilding. Swayambhunath in Kathmandu Valley, Nepal. Great Stupa of Boudhnath, Kathmandu valley, Nepal. This page was last edited on 26 February 2019, at 07:33.